How to fix my Asus RoG laptop's boot/sleep exit speeds? My gaming laptop, an Asus G551JM is having some weird boot issues. It used to have a hybrid drive, and after the drive broke I bought a new Kingston UV500 960GB SSD for it. After installing Windows 10 on it I quickly noticed that the boot times were... odd. Sometimes a boot lasts 2 minutes, sometimes around 40 seconds. I ran a boot cycle test with Windows Performance Recorder. The pre-session init phase seems to take around 30 seconds, the rest very little. It just feels like something is stalling... and once it times out the computer then boots really fast. I'm new to the program, so I admittedly don't really understand them well. Perhaps some of you are familiar with them? I've also ran a few disk check programs and all of them have reported that the disk is in excellent condition. It moves files fast and seems to work great in actual use. Also, oddly, the computer would restart whenever it was trying to recover from sleep mode... but I kind of fixed it. I read that some Asus laptops with sleep mode issues start working if you re-flash them with the same BIOS it already has, using WinFlash. I've also read that Asus laptops sometimes have issues with the Intel Management Engine Interface, so I've tried fiddling with it. I've tried to disable it from device manager. Tried an older version. Doesn't seem to do much in my case. Dunno if it's doing something in my case. I'm handier with computers than the average person, but I'm not a professional. I feel like this is way out of my skill level. I would be most grateful for any help that you can offer! Any chance that the slow boots are due to it trying and failing to boot to a USB device, such as a flash drive or external hard drive? I've definitely seen problems like this when a USB drive is plugged into a computer during boot-up. I've corrected it by either unplugging the device or setting the machine not to boot to USB drives in the BIOS. Ah yes, my laptop has an USB headset and an USB mouse. I've tried unplugging both before, then using the integrated trackpad to restart the computer. My mouse has on-board memory and it crossed my mind that maybe something would go wrong trying to access it or something. You say you installed Windows 10. Was this an upgrade or a fresh install? I assume fresh install since it was a new SSD, but worth asking. Did you reset the BIOS to defaults after reflashing? Yeah, it was an unformatted SSD, fresh off the box. I downloaded it from the official Microsoft site. Since my previous drive had a legit version of Windows 10, this one didn't need a new key. I did reset the BIOS to default settings after reflashing. I tried default settings before reflashing, too, though. 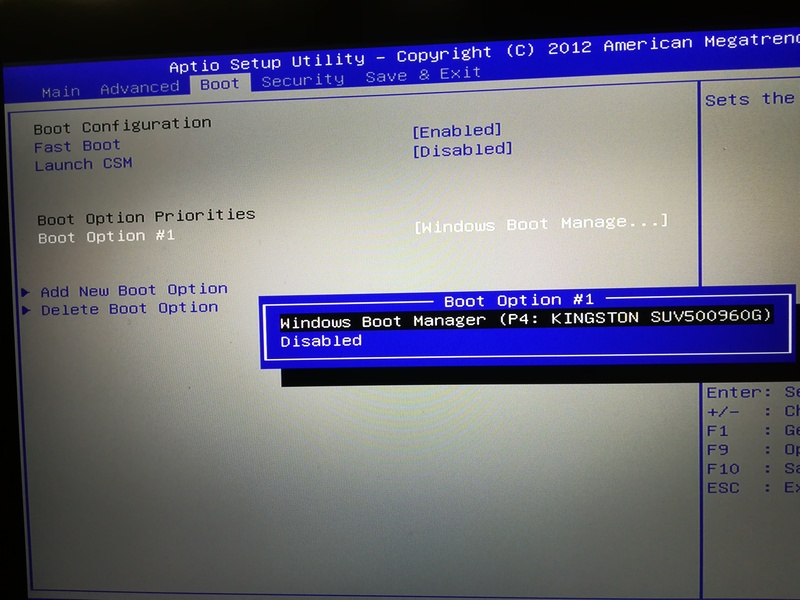 The BIOS has a Fast Boot option, plus some security settings and CMS. I had to change the settings to make it boot from an USB, and I reset them to defaults afterwards. Edit: I dunno if this is relevant, but for a while after the install I saw a "phantom drive" in the partition manager. I assume that was just from me using an USB to install the OS. It disappeared afterwards. Just for good measure, check what happens if you disable every type of boot device in the in the BIOS' boot priority order except the hard drive (eg. optical drive, floppy, usb, network). My only (listed) boot option is "Windows Boot Manager". I do have a DVD drive, but it's not listed as a boot option. For good measure I just tried setting everything in I/O to locked and booting. After that, I reset the BIOS settings, booted, then typed this reply! Is the Intel chipset software definitely installed? I know these are extremely basic suggestions, but, at the moment, I can't think of anything beyond the basics that causes this sort of issue. Pretty sure they are, but I tried running that anyway! I then restarted the computer, checked windows update and yeah, no new updates, seems like. The old one was a hybrid drive with 128GB SSD and 1T HDD in one. The SSD part of it eventually broke, after years of use. At first I thought that the partition tables were messed up, but no partition repair program was able to find any trace of it. The model of the old one is HTS541010A9E680, but oddly you'll find drives with different specs with that on Google. Anyway, thank you for your time! If anyone here finds a solution, cool! If not, I guess I'll have to manage. I'm glad to hear that Asus has good tech support. I'll give it a try. To me it sounds as though you had and still have two drives in it, one of them about to fail causing large detection timeouts. As your reported old HTS541010A9E680 is no hybrid drive, you might simply have taken it for one and the ssd part was, and most probably still is, onboard, as in and PCIe SSD drive (.m2/nvme). Please consult your bios what drives it sees and show that to us. I did wonder about the weird SATA listing, but didn't think too much of it. 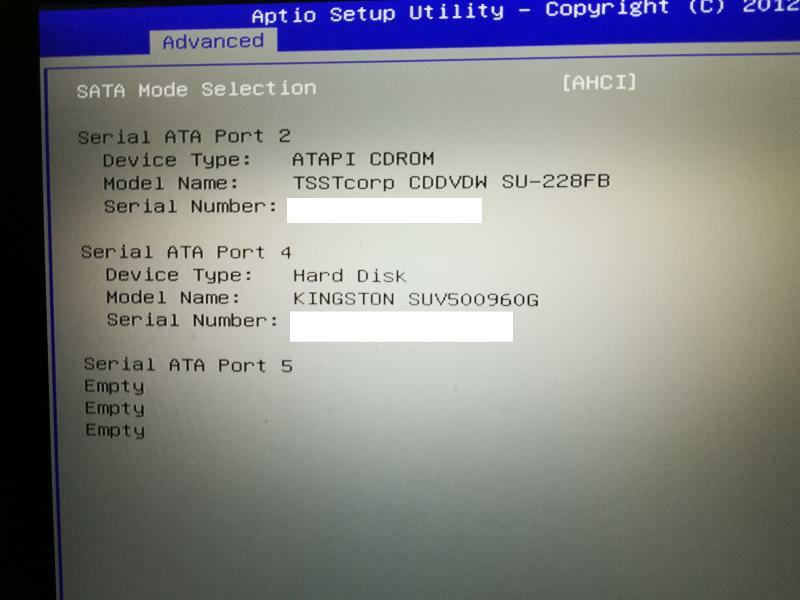 So you think that the empty slot 5 could be a faulty internal SSD? Edit: Oh, or it might have something to do with the SSD cache thing. I dunno how exactly those work, so maybe that's it? Hmm. The boot list is... short. I am still not convinced as to whether there is a 2nd disk or not. ...weird, it says 97GB free. In reality I have 50GB free out of 93,6GB on C:, 608GB free out of 702GB on D: and 97,66GB unpartitioned. Ok. Then I suspect this is a hardware problem, not disk related. Please use knoppix or some other Linux live OS and test with it. Even better: backup windows and install Ubuntu on it for testing. Another thing: can you find out, what storage constellation you bought? I took the full model code off the box it came in and put it in Google. I couldn't find an English language site for it! Mine only came with 8GB RAM originally, and a different DVD drive. Definitely the same model, however, and I'm pretty sure I had a 128GB SSD. I always juggled a little to fit stuff on it! It's funny, I first thought that it would have had a separate HDD and SSD. Once I first opened it up (to install RAM, I think) I went "Oh! There's only one drive? A hybrid? I guess that's a thing." And now, it seems, I learn that it had an internal SSD and a separate HDD. I feel really silly now. But this is why I came here, I had no idea what was going on. I focused so much on staring at test logs and testing device drivers, never checked my actual hardware properly. I think you solved this mystery! Just in case I'm going to test Linux as you suggested, but yeah I now fully expect it to boot slow as well. Read about where to find that second drive and remove it. Maybe it is half-dead causing this. Yep, I didn't even need to install the Linux, it was running snappy even from USB. Then I tried sleep mode and... well it took AGES and left some black glitchy gunk on the screen. So the bad news is my laptop has a bad internal part. The good news is I (probably) have a perfectly good SSD (new) and a good HDD (old). Thank you very much to all of you. There's no way I would have figured this out on my own!